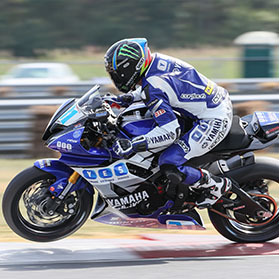 Graves Motorsports Yamaha R6 WORKS Fixed Rearsets for the 08-19 model bike. Featuring billet aluminum construction, M1 footpegs, double roller bearings in the brake + shifter pivots and carbon fiber heel guard (one side only). Kit includes shift rod set-up for a Dynojet quickshifter sensor. Note: Works adjustable rearsets require removal of the stock kickstand assembly to install. These works rearsets are for track use only and do not have a kickstand. Graves Motorsports unique adjustable M1 footpegs offer superior grip via the large CNC’ed teeth and comfort due to its large contact patch and ability to be rotated to any desired angle. The lever tips are collapsable and feature a high grip, rubber cover ensuring positive grip and feel when shifting and braking.